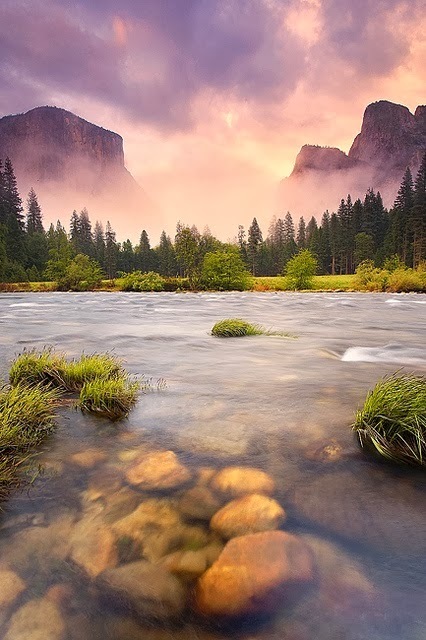 Yosemite National Park is a United States National Park spanning eastern portions of Tuolumne, Mariposa and Madera counties in the central eastern portion of the U.S. state of California. The park, which is managed by the National Park Service, covers an area of 761,268 acres (3,080.74 km2) and reaches across the western slopes of the Sierra Nevada mountain chain. Over 3.7 million people visit Yosemite each year: most spend their time in the seven square miles (18 km2) of Yosemite Valley. Designated a World Heritage Site in 1984, Yosemite is internationally recognized for its spectacular granite cliffs, waterfalls, clear streams, Giant Sequoia groves, and biological diversity. Almost 95% of the park is designated wilderness. Yosemite was central to the development of the national park idea. First, Galen Clark and others lobbied to protect Yosemite Valley from development, ultimately leading to President Abraham Lincoln signing the Yosemite Grant in 1864. Later, John Muir led a successful movement to establish a larger national park encompassing not just the valley, but surrounding mountains and forests as well - paving the way for the United States national park system.